As I write this, Steve and I are traveling around Florida visiting friends of Reach Beyond. Our appointments have been wonderful. We’ve met with people who inspire me. A commonality among the people we’ve met is that they have all learned to handle the stress of life with calm. Stress comes in all different shapes and sizes. For me, it’s the pressure of book deadlines, raising money for a non-profit, staying in different hotels every night, or worrying about sick grandkids. For you, it might be the financial pressure you’re facing, a diagnosis you’re wrestling with, a relationship that’s fractured, or an assignment that’s looming. Here’s what I know: it’s doesn’t matter what season of life you’re in, there will be stress. The question is, how do we posture ourselves to handle stress with confidence and calm rather than becoming frantic and frazzled? This morning, as I was meditating in Psalm 37, I was again struck by the postures of a calm heart. These are choices you can make no matter what stress you’re facing! Choice #1 – Don’t worry about the motives of others. The Psalmist David writes, “Do not fret because of those who are evil or be envious of those who do wrong” (Psalm 37:1).Here’s the thing: no one is completely evil or completely good. All of us have mixed motives. In the stress of broken relationships, it’s easy to conjure up stories of what other people are thinking. Don’t do it. You can’t know another’s motives. Instead of growing paranoid about what others are thinking and saying, assume the best. Choice #2 – Demonstrate your trust in the Lord by cultivating faithfulness. David writes, “Trust in the Lord and do good; dwell in the land and enjoy safe pasture” (Psalm 37:4). Make it your goal to cultivate faithfulness to the Lord. Yesterday, Steve and I received news that a dear friend and mentor of ours, Dan, had gone home to be with Jesus. Last night, Steve and I were reflecting on Dan’s life. Every morning, Dan spent time in prayer and in the Word. I remember seeing him early in the morning, rehearsing verses on index cards that he had memorized. He continued this practice into his nineties. Dan cultivated a life of faithful trust in the Lord, no matter what stress he faced. Think about how others will remember you when you’re gone. Will they remember you as cultivating faithful trust in God? Put practices in place nowthat will build your trust in God over time. These practices will sustain you when life becomes stressful. Choice #3 – Learn to enjoy God’s presence. David writes, “Take delight in the Lord, and He will give you the desires of your heart” (Psalm 37:4).The time you spend in God’s presence strengthens you for the times of deep stress. 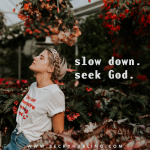 You can fill your hours with Netflix, shopping, Instagram, or a host of other activities, and none of those activities are wrong—unless they are what you run to instead of God. Ultimately, Jesus is the only one who can bring us the deepest joy. When stress surrounds you, run to Him first! Choice #4 – Give your worries to the Lord. When David writes, “Commit your way to the Lord; trust in him and he will do this” (Psalm 37:5), the Hebrew word for ‘commit’ means to roll. In other words, roll your heavy burdens onto the Lord’s shoulders because His are big enough to carry them. How do you do this? First, through prayer. Learn to dump all your worries at the feet of Jesus. Second, lean into your community and allow them the privilege of helping you carry your burdens to the Lord. Recently, Steve and I have gone through an extraordinary season of stress. Both of us have carried our worries to the Lord in prayer, but in addition our close friends have surrounded us with support and prayer. I am so thankful for this group who continue to check in to see how we’re doing with all the stress. They are helping us lift those burdens onto the Lord’s shoulders. Friend, the same holds true in your life. Learn the value of pressing into your community to help roll those burdens onto the Lord. Choice #5 – Be still and wait. David’s wise counsel, “Be still before the Lord and wait patiently for him (Psalm 37:7). When you’re completely stressed out, you become frantic to solve the problem—but it’s easy to make impulsive decisions that serve only to create more stress. A good rule for seasons of great stress is to slow down, pause, and pray. Often the cause of stress in our lives is people. Maybe it’s the critical email or the angry phone call. Rather than hitting reply or lashing back, step back and pause. Pray and wait for the Lord to show you the right words. Now let me clarify, the Psalmist is not saying become paralyzed. There are times when the best thing to do is to take action. He’s just saying slow down. Seek God. Take thoughtful action. Don’t make impulsive decisions that will come back to bite you. A good rule of thumb is that every decision you make should come out of your deep rootedness in Christ. Friend, stressful seasons will come. Develop the practice of asking the Lord to fill you with His Spirit every morning. Holy Spirit, fill me with yourself today so that in every stressful moment my heart is in sync with yours. I am speaking this week at the Christian Product Expo conference for Christian bookstore owners in the Poconos. Pray that the Holy Spirit fills me and speaks through me as I seek to encourage the bookstore owners. Please pray for Steve as he continues to lead Reach Beyond. Pray for wisdom and strength.